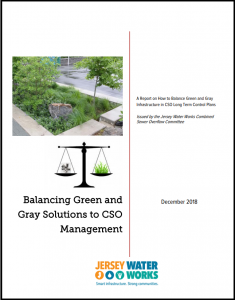 The purpose of this report, Balancing Green and Gray Solutions to CSO Management, is to provide guidance to CSO permit holders and their Supplemental CSO Community Teams, to help guide the development of LTCPs for determining an optimal green/gray balance. Although the target audience is permittees and their communities, other readers should benefit from the summary of current CSO programs. It is recognized that there are varying paths towards inclusion of GI into LTCPs. Developing a methodology to measure and communicate the balance of green and gray infrastructure is an important component of CSO LTCPs. It is also desirable to promote the use of best practices like the USEPA’s community alternatives analysis roadmap with all CSO permittees. This report is not, however, intended to provide detailed technical guidance to permittees.